In today’s offices, facilities and factory floors, there are seemingly endless ways for people to communicate, from email to instant messaging, from texting to calling on landlines and cell phones. No wonder team communications are so fragmented. With all of these disparate tools being used, there’s just one wireless solution that lets teams cut across the noise—so to speak—and allows workers across departments and devices to keep in touch instantly, securely and safely: two-way radios. From hospitality to healthcare, manufacturing to transportation, two-way radios—along with applications and accessories—transform team communications and elevate collaboration to a high level that cell phones and landlines just can’t reach. Radios help companies realize increased productivity, reduced downtime and enhanced worker safety, all for a lower total cost than smartphones. Breaking down departmental silos has never been faster and the dream of a truly unified workforce closer to reality. Whether it’s related to a daily activity or a dire emergency, having to dial a number on a cell phone or landline is a waste of precious time. Push-to-Talk gives radio users instant communications, and with solutions for every situation, they can connect whether they’re in an office or outdoors. During serious incidents or situations, the ability to be in contact with the touch of a button means saving more than time. The convenience of push-to-talk isn’t just for one-on-one communications, it’s for group calls, as well. Setting up radio channels for different groups allows users to reach every member of a team or department at once. Cell phones, on the other hand, can’t make multi-person calls. And time-consuming conference calls on landlines aren’t always possible or appropriate. Thanks to platforms like Motorola’s WAVE Work Group Communications, push-to-talk also isn’t just for two-way radios. WAVE enables push-to-talk for any device that communicates with radios, including cell phones, desktop computers, landlines, laptops and tablets. Connecting devices across departments has never been easier or more seamless. Cell phone connections are only as good as the network they’re on. While service in urban areas is generally guaranteed, coverage for rural users is less reliable, leaving those team members or departments out of critical conversations and decisions. Landlines offer an even more frustrating dilemma—if the person is away from the office, it can take multiple calls to reach them. And not every area of a facility or building can be wired for landlines. Radios offer always-ready reach without the limitations. There are no cell phone networks to rely on, and radios are light and discreet enough to travel with workers wherever they go, from the front desk to the basement. *”Your 20” is two-way radio lingo for your location. Plants and construction sites are noisy places, and landlines and cell phones are no match for the background noise generated by heavy equipment and machinery. Radios, on the other hand, employ noise-canceling technology to ensure every word is heard every time when voice communications are necessary. Headsets, remote speaker microphones and earpieces are just some of the accessories that make radios customizable across departments and teams. Staff can grab radios and go, knowing that they’ll be able to tailor the functionality they need for their jobs, no matter where their work takes them. The U.S. Department of Transportation approves the use of mobile radios while driving, which can’t be said for cell phones. Drivers don’t have to be out of touch just because they’re out on the road, making coordinating with them easy. Changes in directions or instructions can be delivered at all times, increasing efficiency and decreasing downtime. Even after a smartphone is paid for, there are monthly usage fees to pay—forever. With radios, the price of the device and its accessories make up the first and the final cost. Radio fleets can be gradually scaled and upgraded with no impact on service costs. Savings are something every department can get behind. For businesses and industries that don’t ever take a day off, fully charged devices need to be at the ready at all times, especially when they’re being shared across teams. Radio batteries can last long enough to power two full-time shifts, a feat unmatched by cell phone batteries. With their use by first responders, public safety agencies and the military, two-way radios are literally battle-tested. They’re designed to withstand temperature extremes, harsh conditions and even water immersion. That makes them the ideal communications method for use across departments, where the workers may differ, but the need for durability remains the same. Like smartphones, digital two-way radios have applications, and they can handle voice and data, including text messages, emails and even automatic alerts and work orders. But unlike smartphones, they offer the opportunity for workers to focus on the tasks at hand without the distractions of social media, games and the latest must-watch video. Headsets and other accessories allow for a different kind of focus for maintenance and facility staff who need their hands free to complete their work. Protecting property and information is becoming both more important and more difficult, and radios have a key role to play stepping up security and enhancing collaboration. The security benefits of connecting devices across departments apply to both humans and machines. When a piece of equipment or machinery malfunctions, the alert can come from a colleague or the machine itself, and the more people who are made aware immediately, the better the chances of minimizing the damage and danger. For other alarms, the instant one-to-many capabilities of radios mean all relevant personnel are notified in real-time. Responses can be planned, coordinated and executed in the amount of time it takes for one cell phone or landline call. Multiple steps are replaced by just one, streamlining the security process. Radios also enhance security by ensuring interoperability with the police or fire department, reducing response times and easing coordination. Emergencies that overload cell phone towers or knock out landlines leave radio communications intact. While collaboration across departments is vital, an increase in connections can also mean an increase in vulnerability to security breaches. The more users you have, the greater the chances that someone will let their guard down. But radios have a track record of security so strong that they’re trusted by fire, police and military the world over. In industries where the work is dangerous or remote, team communications have an extra job to do: keeping everyone safe. Two-way radios are equipped with safety features sophisticated enough to protect employees even when they aren’t able to call for help themselves. Also known as a “panic button,” an emergency button feature gives workers the ability to call for help with one touch. As with alarms, the call goes out to all relevant users, making it faster and easier to coordinate the response. On the Motorola MOTOTRBO, Lone Worker is a safety feature that’s activated by a lack of user interaction. If the worker doesn’t touch the radio for a preset amount of time, a pre-warning tone sounds, signaling that it’s time to reset the timer. If the worker still doesn’t interact with the radio, an emergency call is placed. The Man Down application is for workers who may become incapacitated. Radios are set to automatically alert if they’re tilted at a precarious angle for a prolonged period of time or if no movement is detected. If the worker is fine, they reposition the radio or disable the alert. If they don’t disable the alert, the emergency signal lets other users know to send help. 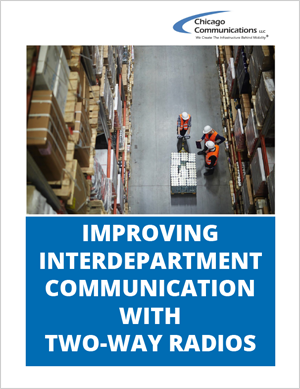 The problem of connecting devices across departments in growing companies has a cost-effective solution in two-way radios. Modern radios deliver immediacy, security and safety, making outdated landlines and consumer-focused cell phones the tools of the past. The right suite of applications and accessories creates a unified communications solution that’s scalable and affordable. For a two-way radio solution tailored to the needs of your business, enlist the help of an experienced channel partner.